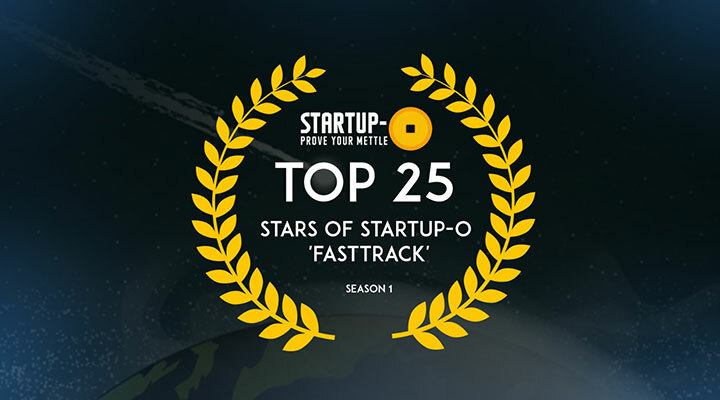 Congratulations to the Top 25 startups from Startup-O ‘Fasttrack’ – Season 1. These were shortlisted from among the 102 startups that registered and 50 participants from across 7 countries and 10 tech categories. We help small businesses in F&B, Retail, Beauty and Wellness to retain their existing customers. We offer a business cloud loyalty service that engages the consumers very swiftly without the need to issue cards, or getting them to download apps, thereby encouraging their consumers to return again and again. We help banks and mobile wallet companies who need a mobile payment solution by offering a SDK that allows their mobile payment application to conduct transactions using a speaker and microphone. By using sound, unlike our competition, we are not dependent on operating systems, or the NFC chip and terminal. We help online apparel e-commerce providers who struggle to minimise returned clothes due to mis-matched and mis-sizing problems by offering a True-to-Life clothes try-on experience on mobile devices that lets customers try different sizes and models on their own body pictures before making the purchase. Unlike other virtual try-on solutions that shows the clothes on some avatars, we are providing solutions for mobile users to see and try the clothes on their own pictures and try them in different sizes. This will reduce the return clothes problem for online e-commerce providers. It also provides better and more personalized shopping experience for users and hence increases sales. We help Global millennials interested in learning languages who want to practice with a native a language they learned, to become advanced or fluent by offering a language exchange platform that helps them meet teachers to teach them, or other learners to “swap” languages and teach each other unlike our competitors, we are offering a better service (smart matching, and guidance throughout their chat) and we are better+cheaper at tech execution. We connect students of foreign languages with native speakers of their chosen language, to help develop their proficiency and fluency. They are also able to connect with fellow students of their own language and thereby “swap” expertise in languages. This is done via a language exchange platform that helps them meet teachers. We differentiate from our competition, as we offer a better service (smart matching, and guidance throughout their chat) and we are better+cheaper at tech execution. Unlike our competitors, we are a one stop-shop for both eye tracking and emotion detection packaged in a simple web application. Our technology can be flexibly applied in any given online/offline consumer environment and is able to track multiple individuals in one frame , we are 2x cheaper and take only half the time to provide results. Emmfer is the most flexible, robust and accurate consumer research solution with almost no setup time! We help young drivers who are buyers of used cars by offering a matching service that helps drivers find reliable car workshops. Unlike traditional forums, we are highly targeted and only seek out the best workshops. Unlike our competitors, we are able to able to trigger processes on the computer upon detecting objects in the physical world; our system is significantly easier to set up via drag-and-drop steps. We help musicians and creators of music at any level, music students, fans and music lovers who want to express their music ability, show their music creations and get discovered by the world by offering a music social media where they can create music, collaborate and recreate music. They can build their network using our platform, publish and sell their works. This can allow them to be more creative, more expressive, and more connected to the world with no time and space limitations.Their music becomes easy to publish and can reach a wider audience. Unlike our competitors that are like ‘users pay to use the service, we are a free user generated market place for music creation. We are equipped with a Music Social Network platform and a clear administration of creation copy rights. We receive a commission from the tracks/song trade and share the revenue with the creators and copy rights holder. We help MNCs and growth-stage startups who are looking for tech talent by offering a data-driven curated marketplace of tech talent that are engaged and pre-qualified for the job. Unlike our competitors, we are a low-touch solution which places candidates in top companies without ever speaking to a candidate. Hearti is an integrated platform with HRM functions and wellness marketplace with a focus to improve employee engagement within an organization. Our wellness marketplace allows HR personnel to conveniently implement wellness prgrames for staff within their organisation while also giving them access to a wide range of cost saving deals. With our software platform, we help automate and reduce paperwork (i.e applying for claims and leave) thus saving time and money for the employees especially the HR. With Hearti, HR and employers can now easily roll out personalized incentives and benefits to engage their employees in the effort to retain and attract their best talent. We help blue-collar companies who have complicated work pattern and policies which rely heavily on manual data administration and tabulation by offering a localized and industry-specialized Human Resource Management System that features proprietary algorithms that handle complicated work pattern and calculation, through an integrated platform that minimizes manual work, therefore automating all tedious HR matters. Unlike our competitors that are generic HRM, we are specialized HRM that follow industry best practices that used by 11% of the Security Agencies in Singapore, and are expanding into the Cleaning, Manufacturing and F&B industries. Unlike human interviewers, we are 10x faster, 70% cheaper and unbiased. We help Financial Institutions who face losses through documentary fraud by offering a real time, extremely accurate, fully anonymous, blockchain based solution that prevents fraud in a proactive manner and takes prescriptive steps automatically. Unlike the current solutions which only give historical information after the fraud has been committed, we are creating a new fraud, risk and loss prevention platform that will allow financial institutions to lower their risk profile and boost bottom line without sharing confidential information. Unlike our competitors, we are more advanced in scheduling system, such as SMS confirmation, waiting list feature, and delay notifications. We help B2B SMEs and High value B2C companies who spend on digital marketing to attract prospective customers to their website and need a tool to help them increase their web to customer conversion ratio by offering an instant response call back tool that notifies the sales team the instant a lead is generated. Sending vital analytics and data to the sales person such as what the lead has viewed on the website, how much time they spent, how often they have been to the website and much more comprehensive data so they know exactly what to target. The AI engine will also automatically learn what is the best way to engage with a visitor based on data points such as time of day, day of week, referring website, time on site, pages visited, etc. Unlikeour competitors, which is difficult to sell complex and high value products, we at Lucep provide significantly more information than our competition, allowing for businesses to track every single lead and manage appropriate follow up for each lead. We help nail polish fashionistas who require specific colours by offering a bespoke service that allows them to customise nail polish in any colour in the world. Unlike our competitors, we are able to respond to market trends 10x faster and provide our customers with exactly what they want at an affordable price. Unlike our competitors, we are cheaper, faster and more convenient. PaidUp is new cashless e-wallet app that enables users to get more from their favourite stores by paying upfront in return for exclusive discounts, freebies and rewards. It also enables customers to order food + drinks on-the-go and save time by no longer having to wait in line. The app has been designed to support small and medium businesses in emerging markets by letting them crowd fund working capital directly from their customers and build a stronger relationship with them through the use of analytics and data. Founded in Jan 2016, they currently have 100+ partner restaurants, coffee shops and wellness/beauty establishments across Manila. Unlike our competitors, we are cheaper, faster in virility, and more organic. We help social and amateur footballers to organise matches or simply enjoy a game of football by offering an all-in-one solution that connects players and teams, secures booking of venue or referee, and facilitates hosting or joining a game. Recommendations are made based on availability, player profiles, preferences and cost. Unlike our competitors, which do not provide a full ecosystem of players / teams, venues and referees, the essential elements for a football game, we are at least 10X faster, definitely better and most value-for- money by offering team and individual performance-tracking as well. We help businesses who need rich customer information but experience high customer acquisition costs by offering a DaaS and SaaS solution that standardize, digitize and automate how personal information is organized, exchanged, and processed. Regit is an integrated platform for individuals and businesses to exchange personal information securely, efficiently, and transparently. Unlike our competitors that focuses on storing personal data (information is for using, not storing) or other networks that provides partial or unreliable data (which is worse than no data). We are a team of Professionals with ­­­­5 years’ experience in Banking, IT security, and Compliance that has intimate knowledge of this space and a strong engineering team. Unlike our competitors, we are more intelligent, faster and cheaper. Unlike our competitors, we are better in terms of lead quality and cheaper with dynamically priced leads. Our Company, Whizpace converts smart products into “smart connected products” by providing a wireless communications solution based on the idea of providing more services with limited resources using scarce spectrum dynamically & opportunistically for 50B devices and 3B unconnected population. We help companies engaged in B2B e-commerce to generate personalised sales catalogs in just 1 minute by using our B2B Sales Catalog Builder. This allows them to eliminate their reliance on outdated and cumbersome means (e.g. Excel). Unlike our competitors, we are fastest to configure, easy to operate, economical, easy to deliver and easy to use for end consumer because of unique weblink based output of each catalogue.